Good news: undergraduates may now check out DVDs for 3 days. Did you know that TCNJ Library has over 7000 DVDs, available for checkout at Media Services on the 4th floor? No disc player on your laptop? No problem! Check out a portable DVD drive from Media Services. TCNJ Library is excited to announce the launch of two new online services. Please see the brief descriptions below then follow the respective links for more information about and links to each service. Are you having trouble identifying sources for your paper? Are you lost somewhere in the library trying to find a book on the shelf? You can now text a librarian for help at (609) 482-3981 from anywhere inside or outside the library. The five-story, 135,000 square-foot facility includes traditional library collections and services in an atmosphere that is elegant yet friendly and inviting throughout. 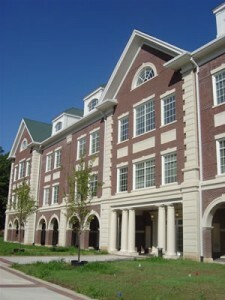 The building provides 26 group study rooms, a café, a late-night study area, and a 105-seat multi-purpose auditorium. The College of New Jersey Library, in support of the College's mission, provides high-quality information resources, expertise and a learning environment that enhance the search for knowledge and understanding. The Library serves as an intellectual, cultural and social center for the College, empowering TCNJ community members to become self-directed, lifelong learners and responsible citizens.